The number of poles* on a switch defines how many separate circuits the switch can control. So a switch with one pole, can only influence one single circuit. A four-pole switch can separately control four different circuits. A single-pole, single-throw (SPST) switch is as simple as it gets. It's got one output and one input. The switch will either be closed or completely disconnected. SPSTs are perfect for on-off switching. They’re also a very common form of momentary switches. SPST switches should only require two terminals. Another common switch-type is the SPDT. SPDTs have three terminals: one common pin and two pins which vie for connection to the common. SPDTs are great for selecting between two power sources, swapping inputs, or whatever it is you do with two circuits trying to go one place. 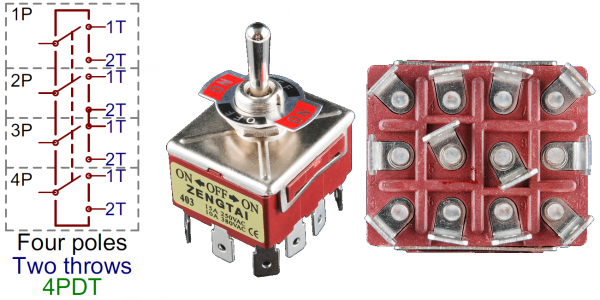 Most simple slide switches are of the SPDT variety. SPDT switches should usually have three terminals. (Sidenote: in a pinch an SPDT can actually be made into an SPST by just leaving one of the switch throws unconnected). A DPDT circuit symbol, and a 6-terminal DPDT rocker switch. When a momentary switch is not actuated, it’s in a “normal” state. Depending on how the button is constructed, its normal state can be either an open circuit or a short circuit. When a button is open until actuated, it’s said to be normally open (abbreviated NO). When you actuate an NO switch, you’re closing the circuit, which is why these are also called “push-to-make” switches.